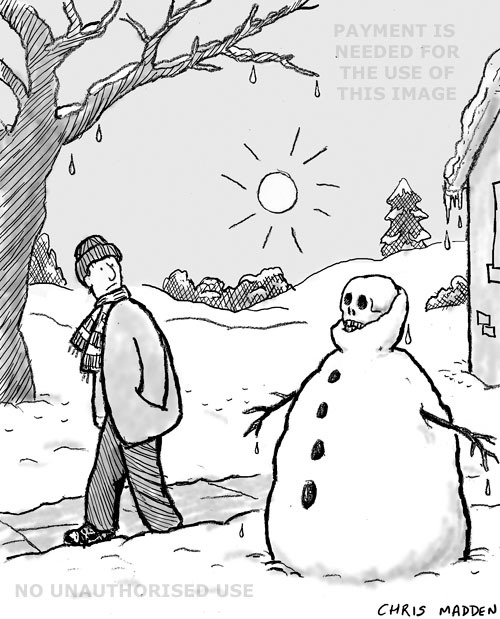 A snowman melting – revealing that inside the snowman’s head there is a human skull. 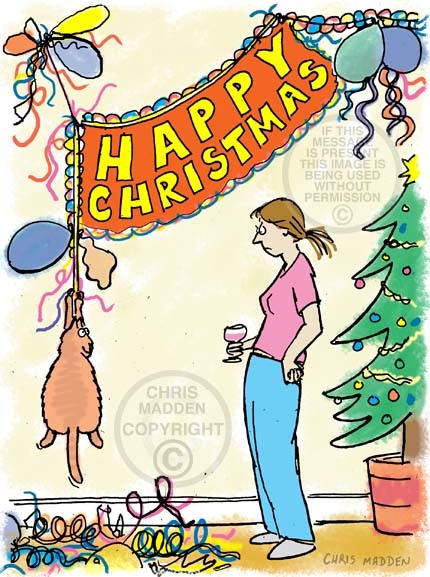 To see my Christmas cartoons please click the image on the right, or click Christmas cartoons here. 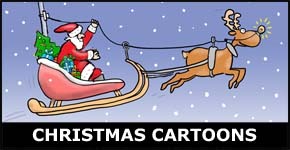 This cartoon has references to the inflatable santas and inflatable reindeer that are sold as Christmas decorations, although the original version of this cartoon was actually drawn quite a few years before inflatable Santas came onto the market. 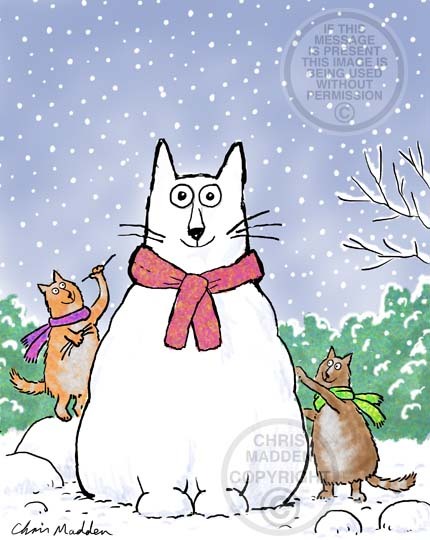 The illustration can be used as a Christmas card or any other form of Christmas use. This cartoon reindeer can be used as a Christmas card or any other form of Christmas use. If it is used as a high-volume commercial Christmas card a royalty based payment agreement is necessary. A cartoon about Santa Claus’s reindeer, Father Christmas delivering Christmas presents. 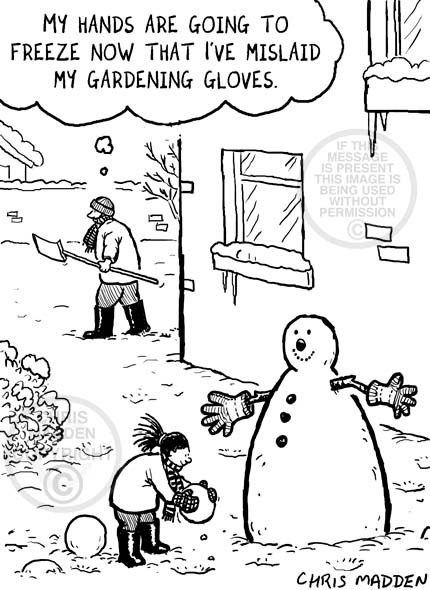 Cartoon of a gardener using all of the gloves that he received as Christmas presents as frost protectors for the plants in his garden. The man’s wife thinks that he should spend more time decorating the house than outside in the garden. A cartoon showing a keen gardener receiving a Christmas present – a “grow-your-own” oak tree. In other words, an acorn. A joke about men’s hobbies and pass-times, planting trees, re-establishing woodland, conservation, green Christmas presents. A cartoon showing a gardener using an unwanted Christmas present (a tie) to secure a sapling to a stake. Cartoon about garden and outdoor decorations. Cartoon showing a man giving his wife a Christmas present. The gift is something that he wants himself, and that he intends to use. 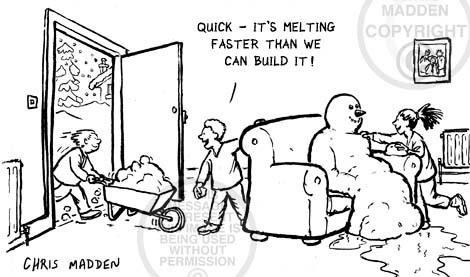 Winter gardening cartoon. A child builds a snowman and gives it gardening gloves as hands. Meanwhile, the child’s father is looking for his gardening gloves because it’s so cold. A slightly dark and sinister Christmas joke about the shattering of dreams and things going horribly wrong. The flying snowman is holding a child’s glove in one hand. 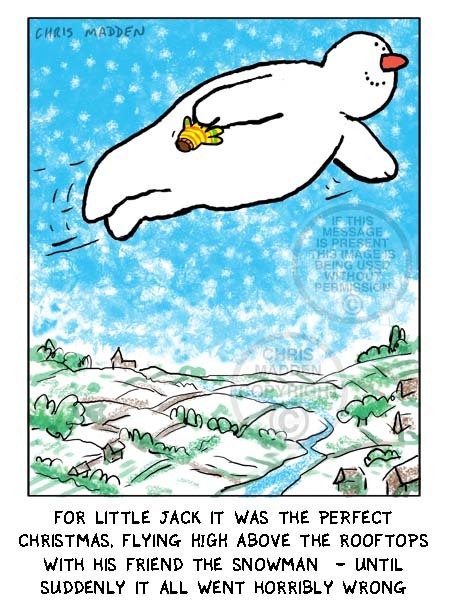 The implication is that the snowman took the child for an enchanted flight – but that the child’s hand slipped out of the glove in mid air. I’ll leave the rest to you. The cartoon uses the Biblical phrase “Get thee behind me Satan” (used by Christ when tempted by the devil) and transforms it into the words used by a mother when her child is tempted by Santa. 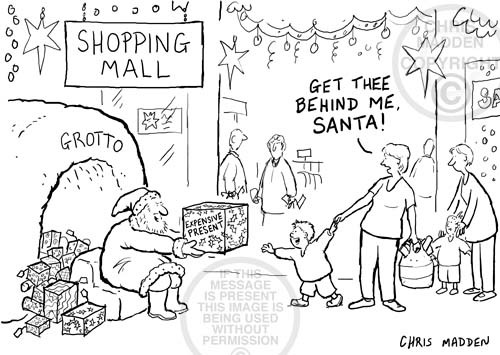 A Christmas cartoon about temptation, pester power, shopping malls, shopping. Christmas cartoon. 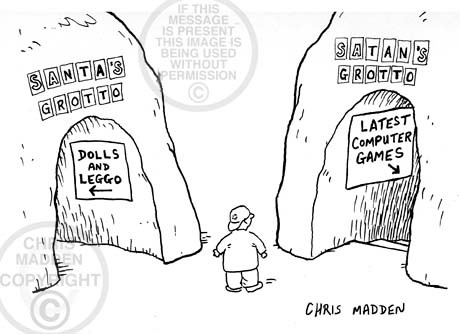 Which to choose: Santa’s grotto or Satan’s grotto? Cartoon showing a child standing between two grottos offering presents. One is Santa’s grotto and one is Satan’s. Both are tempting the child with the offer of presents and material gifts. Maybe Satan’s gifts are less wholesome. This cartoon isn’t meant to be particularly profound or meaningful in any religious way by the way (as I’m an atheist). It’s just a simple observation about temptation and the fact that Santa and Satan are anagrams of each other. A cartoon or illustration that illustrates temptation, difficult choices, bribes, xmas, bribery. Pet owners often give Christmas gifts to their pets. A snowman melting during a thaw – revealing that inside its head the snowman has a human skull. Santa’s flying reindeer are just a Christmas myth shock! A cartoon about myths, beliefs and traditions. Christmas cartoon. Is it time for Santa Claus to update his clothes? He still keeps his trademark red though! (Apparently based on the corporate colours of Coca Cola). A cartoon about the media, journalism, tabloid journalism, religion, myths, tradition and Christmas.